After receiving a request from one our our contacts, OEM in Ontario and for the benefit of a GIANT in the food industry, we have “converted” our SLP 150 strechwrapper to respond to the requirements of the food industry. This SLP 150 is now fully stainless steel and even its electrical components NEMA 4X are resistant to any corrosion. 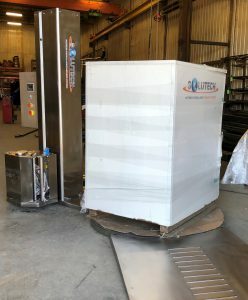 Another step forward for Solutech with this flexibility which we offer to our customers with such requirements having to change from steel to stainless steel. Congratulations to our team and welcome too all food companies whose requirements require Stainless steel, we now have this expertise and we will be glad to build it for you. THANKS to this integrator, OEM, who used our services to offer this solution to his customer, Jason Taylor, PEng, MBA, PPI Packaging Products Inc.